I look forward to Meatloaf leftovers no matter which recipe I use. Grilled Meatloaf sandwiches are a great treat. 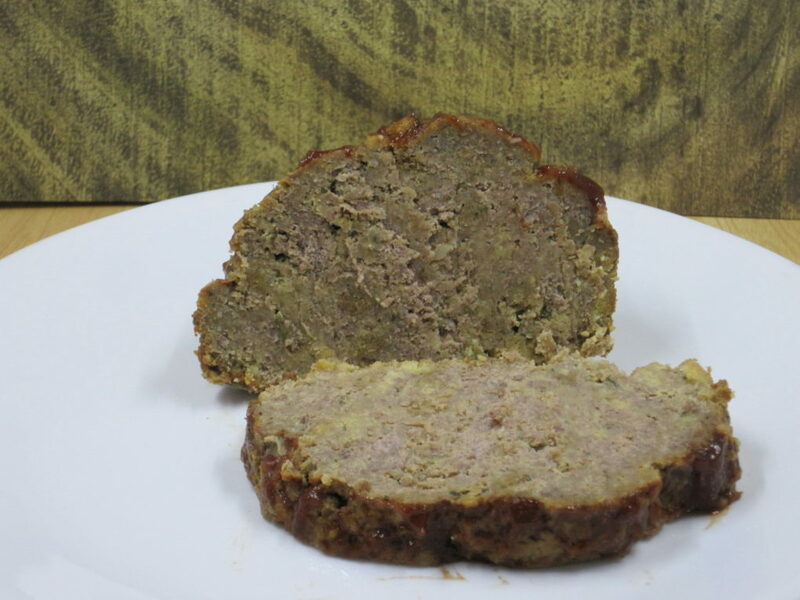 Give our recipe for Stuffing Meatloaf a try and let us know what you think by leaving a comment below. Place corn bread stuffing mix into a bowl large enough to accommodate all of the ingredients. Pour the water over the stuffing mix and mix well to moisten the stuffing mix. Add ground beef, eggs, and dried minced onions to bowl with stuffing mix. Add 2 tablespoons of ketchup and 2 tablespoons of barbecue sauce to bowl with the other ingredients. Mix ingredients well, incorporating all of them together. Form meat mixture into a loaf shape and place it into a loaf pan that has been sprayed with non stick spray. Mix together the remaining 2 tablespoons of ketchup and 2 tablespoons of barbecue sauce. Spread the ketchup and barbecue sauce evenly over the top of the meatloaf. Nutrition Information is for 1/8th of the finished meatloaf. Yum! Meatloaf is delicious comfort food. I never thought to use cornbread stuffing mix instead of regular breadcrumbs. Fantastic idea! I love all of the flavor that is added to the meatloaf through the simple addition of the stuffing mix as the breading. You know as a kid I literally hated meatloaf. I would tell my mom not to make it. NOW I LOVE meatloaf. I love cornbread too…so I know this would be a winner dinner here. Gloria, you aren’t alone. When I was a kid, I would only eat meatloaf if I could dip each bite in ketchup. I could eat meatloaf year around regardless of having to turn on the stove. 🙂 Hubby and I love meatloaf and I look forward to making AND eating your delicious recipe! I love meatloaf and could eat it all year long, but when it’s 110 degrees outside, I don’t want to turn on the oven. 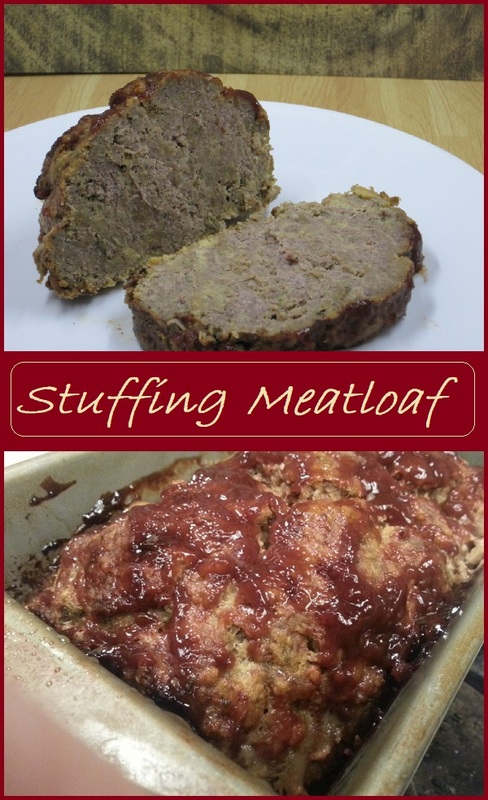 Such a great idea to add stuffing mix to the meatloaf! It looks beyond delicious! We were surprised at how good this turned out, and it was very simple, too. My mom used to make meat loaf all the time when I was a kid and she always put a nice sauce on the top, but never any inside like this! What a good idea! My husband wasn’t a big fan of a sauce on top of the meatloaf, so I used to never add it, but over the years, he’s become more willing to eat it that way. I always love to add a little bit of what would be the sauce in the meat mixture. It adds extra flavor. 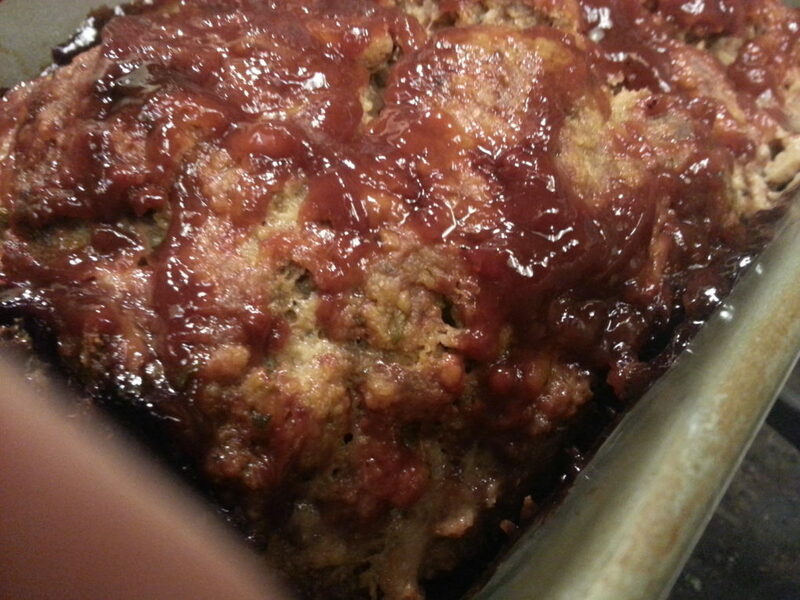 My mom always made her meatloaf with a packet of stuffing mix and it is so very delicious. Can’t wait to give your recipe a go. I hope it tastes just like hers used to. I hope this recipe tastes like your mom’s. My mom never used stuffing mix in her meatloaf. She added all sorts of chopped vegetables, so this was new to me. This looks so delicious! Meatloaf is something I haven’t made since my husband and I have been married, so I’ll definitely to try out your recipe. Yum! I hope you make it for him. It’s so simple that it makes a great weeknight dinner. The hardest part is wating for it to be finished so you can serve it. I haven’t tried making it ahead of time and baking it, but I don’t see why it wouldn’t work that way. Of course, if you freeze it, the vegetables will be softer. If you just put it in the fridge a day ahead, I don’t think it will make much difference. You just might need to extend the baking time a bit. I’m not sure if I’ve ever eaten meatloaf as it’s not such a popular dish over here but it does always sound tasty. It’s one of those meals I know I should try at some point and yours sounds like it has loads of flavour! Corina, you should buy some minced meat and give meatloaf a try. I’ve never met a meatloaf I didn’t like. Meatloaf is my ultimate go to comfort food. I love how you used the stuffing and also a combo of barbecue sauce and ketchup for extra flavor. Sharon, thank you for the compliment. I don’t make meatloaf as often as I should. Baker’s Man loves it. You’re right. It’s the ultimate comfort food. Yay for comfort food! Sometimes they’re the only way to go. I loved meatloaf as a child, and I still love it (albeit the healthier version than the one I grew up with). I often use a mixture of ground turkey and ground beef. I also mostly use leaner ground beef. Baker’s Man would object if I used fatty meats. He’d say that I’m trying to kill him. What a great way to use up leftover stuffing. This is the ultimate comfort food!! The stuffing definitely adds a depth of flavor to the meatloaf, but I didn’t use leftover stuffing. I used a box of stovetop stuffing mix. I suppose you could make this with leftover stuffing, but you’d need to modify the recipe quite a bit. This is a great comfort meal! 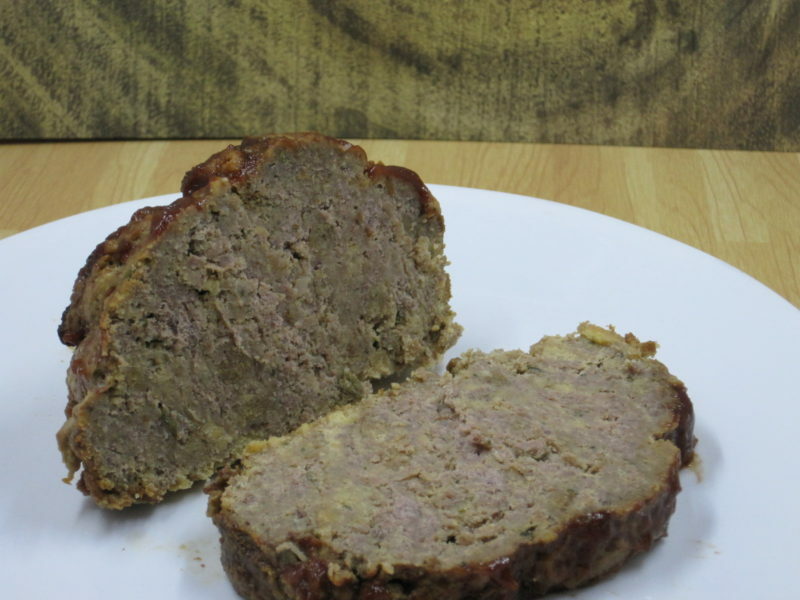 I also like that you add stuffing to this meatloaf) Will definitely give it a try! Meatloaf is a great comfort food. I hope you try this and that you like it.